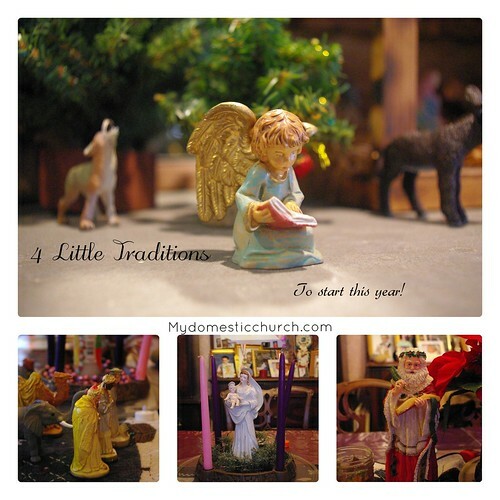 4 Easy Traditions to start this year! These are four little traditions that we started in my home when the kids are little, that my older kids tell me are very special to them now! This post may contain affiliate links. If you click through and make a purchase, I may receive a commission at no additional cost to you. Please read my disclosure policy for more info. 1. If you don't have a nativity scene in your home, this is a good year to start. All that is really necessary is a figure of Mary, Joseph and Baby Jesus. I inherited mine from my mom's old set, but I see them for sale at reasonable prices at estate sales and on eBay too. 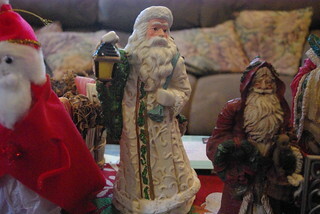 After the basic set, we started adding figurines every year. One year I purchased some sheep, and the next year some shepherds. I added some angels after that. A little wooden house for sale after the holidays became our stable. We have added little trees and shrubs too. A few other odd characters have ended up in our creche scene. 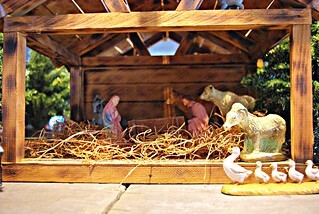 The fat Christmas cow by the manger was an ornament that no longer had a hanger. 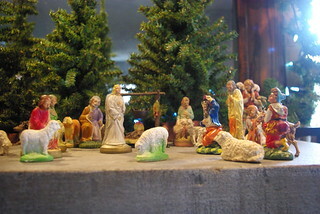 I couldn't bear to toss him, so he now gets to stand around the manger scene. During one of the leaner years, when I couldn't afford much, I bought the little cats for the nativity set because they were only around $10 or so. They've been with us ever since! My husband found some handsome deer that were close to the scale of our other figurines. I realize that North American deer weren't in Bethlehem but they do add to the winter scene of the cold in Bethlehem. Some of the figurines in our set have a special meaning. When my mother died I purchased an old woman from Fontanini in her memory. I also bought a younger maiden for our scene in honor of my daughter-in-law the year she and my son married. I make note of that in the box with the figures so that the children and I remember. Adding pieces one at a time, something new (to us) every year has given us a lot of joy and has really added up to an impressive set over the many years we have been doing it! When my son got married, I bought him and his wife their own starter kit and now I will be gifting them with something new every year to keep the tradition going. 2. 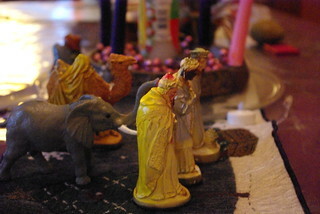 Once you get a set of wise men figurines, don't put them immediately up in the stable with Mary and Joseph. 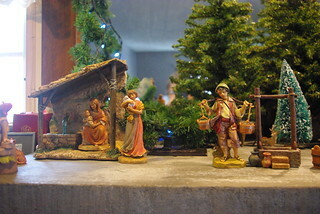 We move them around the house so that they truly do journey to Bethlehem! We start them at the far end of the house during Advent and my youngest moves them forward slowly. They arrive on Epiphany Day January 6. St. Nicholas was from Myrna. Where is that on a modern day map? (Asia Minor). Discuss what that area is like now. St. Nicholas was imprisoned by Emperor Diocletian for his faith. Talk about how Christians can share their faith today. Are Christians persecuted for following their faith? St. Nicholas was known for his generosity. Find little ways today to be generous with each other or with a neighbor or some other friend and do it anonymously like St. Nick! 4. Keep an Advent Wreath on the table. Study the history of wreaths in Germania and Scandinavia. What was the significance of light and of "turning the wheel" in the dead of winter? What is the significance of holly (the prickly leaves are reminiscent of the crown of thorns and the red berries the blood of Christ) ? Each candle symbolizes 1000 years of church history from Adam to Christ. Read some of your favorite old testament stories each day during the Advent season. Choose something small to start with and then continue every Christmas. It's the small things done with continuity that makes memories your children will always cherish.